Remember those lavish company holiday parties complete with big dinners, dancing, holiday gifts and speeches? We didn’t think so. For years, many companies held elaborate end-of-year events at big hotels and invited guests and significant others to join employees for the festivities. But, for most of us, those days are long gone and for some, they have never even experienced the big company holiday party. With the economic downturn a few years back, many organizations opted for smaller events for employees and even though the economy has turned around, it seems that “less is more” has become the standard for most. According to a recent Washington Post article about office holiday parties, a survey by the Society for Human Resource Management indicates that 30 percent of companies do not have end of year parties for all employees. Whether that’s due to financial decisions, overloaded holiday schedules or a change in employee expectations, it does appear that this trend is here to stay. Consider an event around “giving back.” Take a morning or an afternoon to gather at a soup kitchen for some community outreach, participate in an “Adopt a Family” program to gather and deliver gifts to those in need, or bring cookies to a senior center. Or, run a contest in which you ask employees to submit the names of organizations that they feel personally connected to and then randomly select one to partner with for the holidays. And with any of these ideas, schedule a potluck meal or have a little catered celebration afterwards. Charitable events really help bring teams together so keep the momentum going with some team bonding afterwards! Provide a bit of extra time off with “early leave” the day before the major holidays. Many people travel for the holidays or wish they could take some extra time for shopping, preparing meals, etc. By letting your employees leave at 2pm (or other reasonable time) the day before major holidays, they can get those last minute things done and beat the traffic. Remember that even small things like these can make a big difference! Consider a low-key holiday event. Hold a catered event in your cafeteria or a nearby space that will accommodate. Find a few employees to decorate, think about some fun and inexpensive gifts you can give out, and invite families. Have someone coordinate a few games and activities for kids. You can still have a fun party even if you can’t spring for plates of Filet Mignon at a big hotel. Organize “an experience.” There are so many amazing activities out there that can turn into the best employee bonding events. Consider a cooking class or a team scavenger hunt. Rent out a movie theatre that serves drinks and food. How about bowling? These are all about employees spending time together in a casual atmosphere and can be done at a relatively low cost. Regardless of what you do to celebrate all of the great work and end-of-year accomplishments with your employees, a note of thanks and recognition is equally important. Take a bit of time to stop and reflect on what you have achieved together and to acknowledge what lies ahead. 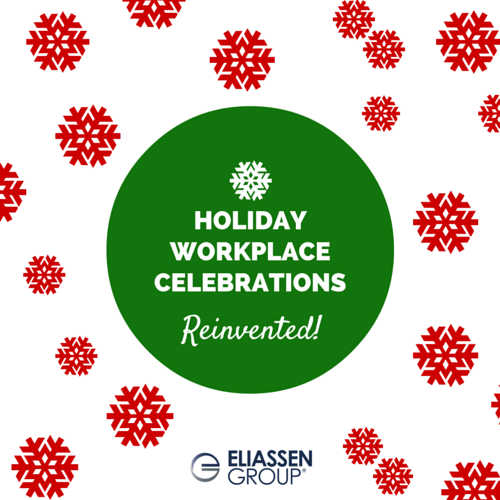 What is your company doing for the holidays? We’d love to hear your ideas…did we miss any above? connect with us out on Facebook and Twitter.